Starburst video slot is an entertaining and easy game to understand! In fact, it’s the go-to game of many new casino players in PA, very much like Emoji Planet. Starburst is a NetEnt game and believe it or not. They once said it’s one of their best-performing slot along with Gonzo’s Quest and Guns N’ Roses. So it means you’re in for a treat if you choose to start your casino adventure with this game. Not to mention that a spin on Starburst will only cost you 10 cents and could give you as much as 50,000 coins. Starburst is also a win-both-way game that has re-spins and expanding wilds. So, given the combination of features this game has, it means you’ll win frequently and have long session due to the great hit frequency. Want to know why some many players love this game? Read what’s next! Bonus Features: Win-both-ways, Re-spins, and Expanding Wilds. First of all, know that the re-spin feature is frequently triggered! In fact, the chances are you’ll activate up to 3 consecutive re-spins in the first 10 rounds you’ll play. Not to mention that the soundtrack is pretty engaging and it gives a great rhythm to the game. Couple with excellent graphics and customizable game options, you’ll for sure love this game. All and all, Starburst is a pretty straightforward game. So, after a couple of spins, you’ll understand that the Bar symbol pay-best and that the bright star triggers the expanding wild. It has 2 game modes, a fun mode that you can play now at Parx or Play SugarHouse. Plus a real money mode that should be available after April 2018 for Pa casino players. What’s not so great about Starburst? To sum up! It´s an excellent game for casino newbies. But know that the other games (listed on this page) have a more substantial max win. But also that high rollers can wager more on them. Additionally, it’s worth knowing that Starburst does not have a free spin game. Instead, the game gives re-spins every time you win. In the long run, as you gain experience, you’ll probably look for other games which offer more challenges, like Steam Tower. All and all, Starburst is a great game to kick off your adventure. Also, many Pennsylvania casino players choose for its versatility and compatibility with portable devices. Not to mention that the spins are pretty cheap. 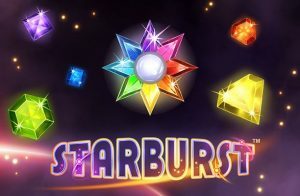 So, if you have a budget to stick to, Starburst is a great game for you… But if you’re a thrill seeker who’s looking for a slot with massive payouts and a high-volatility, then Starburst is not for you. You should instead try Planet of the Apes or BloodSuckers 2 which are also NetEnt games and offers exactly what you’re after.